Since 1923, Sinclair Moving & Storage have been your trusted movers in New Jersey. We’ve helped generations of South Jersey residents with their moving and storage needs from our West Berlin, NJ, location. As an agent for Mayflower Transit, we understand that caring for your belongings is our priority, and we train our professionals to pack your household or office with the highest care. Our family-run business takes professionalism seriously. Our drivers and movers always show up in uniform and ready to work, and are held to the industry’s highest performance standards. At Sinclair, we require our drivers to take part in continuing training and safety programs, and ensure all our drivers are certified. All our employees have gone through background checks and have been drug tested. Our customers can expect the best out of our customer service. We offer prompt and courteous service starting with our Sales Staff, Office Personnel and Management Team. Our South Jersey movers are very honored to have been awarded the New Jersey Warehousemen and Movers Association’s Service Award for Excellence, because of our staff’s dedication to exceptional service. Contact your Sinclair Moving & Storage at 856-753-7400 Today! South Jersey is rich in history. It was settled during Colonial Times by the Dutch, Irish and British. 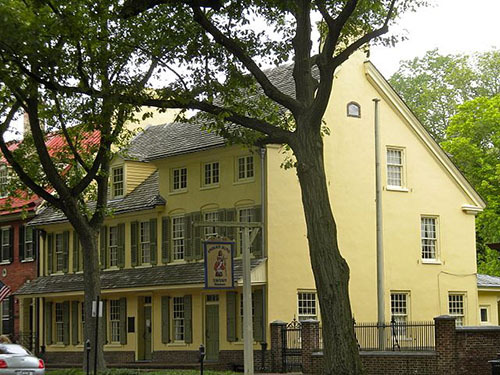 By the early 1700s, many of those whose lived in the area were Quakers. They were hugely influential here. The Borough of Haddonfield was the site of meetings by the New Jersey General Assembly, when they met in 1777 at the Indian King Tavern, during the Battle of Trenton, to ratify the Declaration of Independence of the United States of America. The road between Haddonfield and Moorestown, named The King’s Highway, still exists today in both towns. Part of the Atlantic Coastal Plain, this area is also home to the Pine Barrens. This region’s soil is nutrient-poor, and it is known for the so-called scrub pines that cover acres. These trees are dwarfs; in 1936, a fire burned more than 20,000 acres of these trees during a 4-day period. Even so, cranberry and blueberry bogs thrive here. The region has also been significant for industry. Wistarburg, located in Alloway, was the first successful glass factory in the colonies. The sandy soil was instrumental in the glass production. This factory was in operation nearly fifty years before to the Revolutionary War. The Campbell Soup Company, with its location in Camden, was able to can condensed soup for national distribution in the early 1900s. Haddonfield is also the site of the discovery of the first intact dinosaur bone skeleton, found in 1838. This event was remarkable in that before to this finding, the only dinosaur fossils found were teeth. In 1968, this specimen (named Hadrosaurus foukii) became the first ever mounted dinosaur skeleton. Today, South Jersey is composed of many small, thriving towns. Many of these municipalities still contain colonial-era style architecture in the homes and shops. The population of the region is approximately 1.5 million people. You can read more about some of the residential neighborhoods in our blog. Colleges and universities located here include Cooper Medical School of Rowan University, Rutgers University Camden, Rutgers Law School, and The College of New Jersey. Also, each county has its own Community College, where students can pursue Associates Degrees. Finally, there are many resort communities located along the Jersey Shore, where the fine white sand beaches rival those anywhere in the world. Sinclair Moving offers services through South Jersey including Atlantic County, Burlington County, Camden County, Cape May County, Cumberland County, Gloucester County, Ocean County, and Salem County. 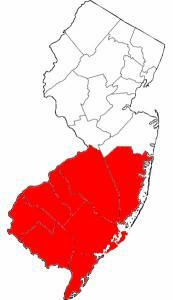 Municipalities include Atlantic City, Barnegat Township, Bridgeton, Burlington Township, Camden, Cherry Hill, Deptford, Egg Harbor Township, Evesham, Galloway, Gloucester Township, Haddonfield, Hamilton, Lacey Township, Little Egg Harbor, Lower Township, Medford, Millville, Monroe, Moorestown, Mount Laurel, Pemberton Township, Pennsauken, Pleasantville, Stafford Township, Vineland, Voorhees, Washington Township, West Deptford, Willingboro, Winslow.